Inbox wrangling – IT or Clinical ? A few months ago I started using a tickler file like system in outlook. My inbox got removed from sight and I moved e-mails from there to a ‘working folder’ a couple of times a day. This worked well, but there was a lot of moving e-mails about. This was annoying as there is enough metadata in outlook to enable this automatically, so after working with the system I spent some time and implemented using Outlook’s powerful (but under documented) search folders. My e-mail folders now look like that, with my work flow bring as follows. 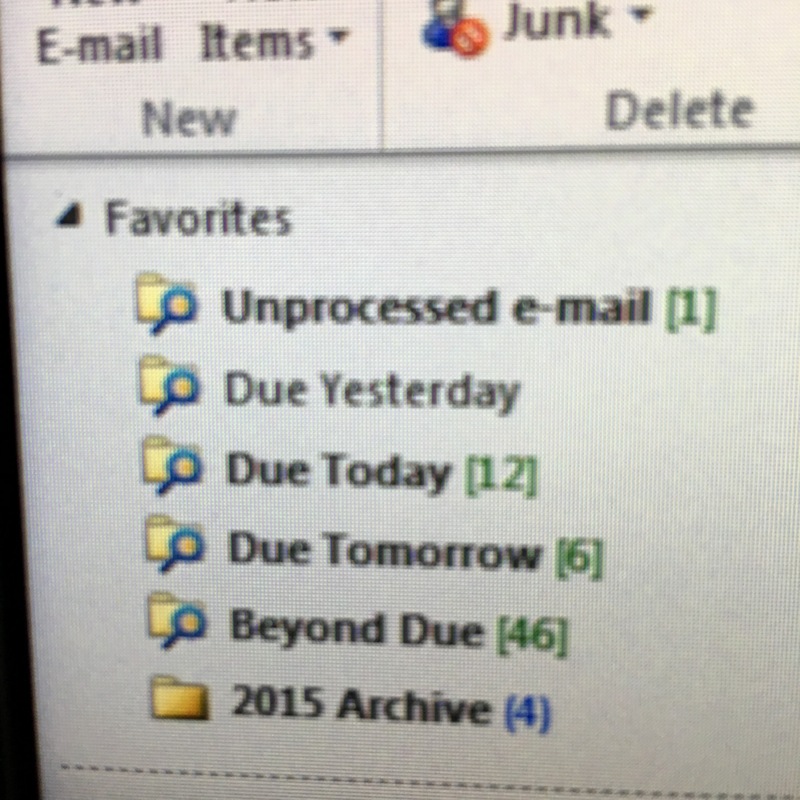 E-mail gets moved into the ‘unprocessed e-mail’ folder a couple of times each day. From there the e-mails are processed (GTD based – email actioned if it will take 2 minutes or less). If the e-mail will take longer a due date is set which will then have it appearing in specific folders. Each morning e-mail due from yesterday gets a quick review and either marked as completed or has the due date altered, which may not necessarily be today. So far this system is working well – it keeps my inbox clear and means I know exactly what is outstanding. IT or Clinical ? Create a free website or blog at WordPress.com.